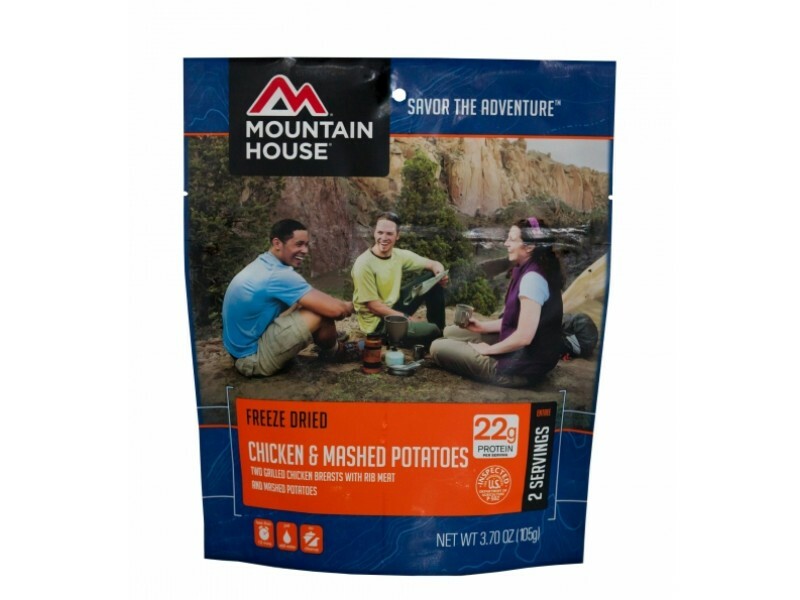 The Mountain House grilled chicken breast with mashed potatoes is a great tasting meal that everyone will love. Everyone will enjoy the thick mashed potatoes with herbs & chives as well as the perfectly seasoned chicken breast. Each pouch contains two servings, which is more than enough food to fill you up. You can store them in your pantry or other area for ten years or more without them going bad, and when you are ready to eat, just open the pouch, add the hot water and wait a few minutes. That’s it! Get yours today so you can enjoy this meal anytime. 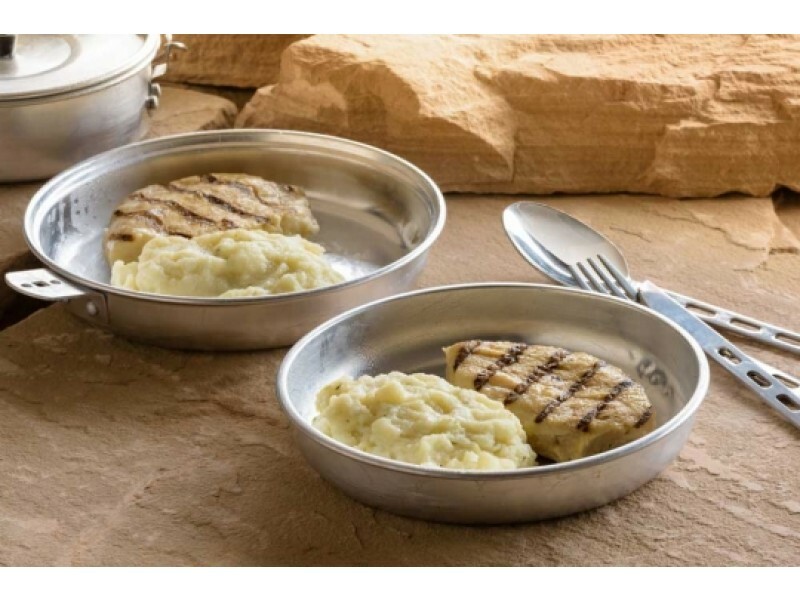 Grilled chicken breast with mashed potatoes is a nutritious meal that will keep you feeling full for hours. When you have this item stored away in your home, you’ll never have to worry about whether or not you’ll have a meal during difficult times. 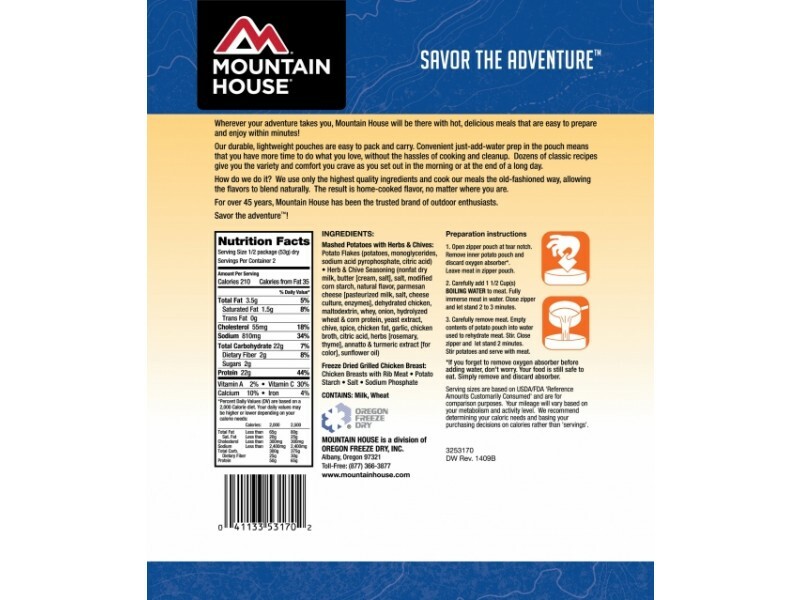 Mountain House has long been known for making high quality, great tasting meals that will last a long time on the shelf, and this is just one more example of that. With a 10+ year shelf life, this food won’t go bad any time soon. Each pouch contains two full serving, which has 24 grams of protein and 210 calories. This is a lot of protein, which is extremely important for keeping you full and healthy, especially when facing difficult circumstances. 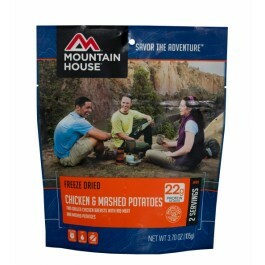 Whether you save this meal for when you’re going through a disaster, or you take them with you camping or hiking, you’ll be glad you have them available. Order yours today and stock them away. You’ll be glad that you have this great tasting chicken breast with mashed potatoes when the times get difficult. Order one pouch to give it a try, or pick up a bunch of them to grow your emergency food stockpile quickly. One pouch contains 2 servings.